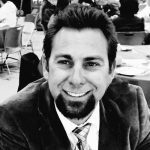 Jeffrey Cervantez, Ph.D. is an assistant professor of philosophy and religious studies at Crafton Hills College in Yucaipa, CA. He holds a Ph.D. in Philosophy from the University of Tennessee-Knoxville, and an M.A. in the Philosophy of Religion and Ethics from Biola University. His areas of focus, as an educator, are in logic, critical thinking, ethics, bioethics, social justice issues, philosophy and religion. As a scholar, he has published articles in journals and books on topics in ethics, political philosophy and religion. In addition to teaching and writing, he has done volunteer work as a clinical ethicist and chaplain.